Have Gas Prices Hit Their Peak? Boy do I have to eat my words. After watching the news and seeing that the price of crude oil had fallen, I told my wife that gas prices would be falling. Well, boy was I wrong. I couldn't believe that prices were moving up again. The Energy Information Administration reported that the nationwide average for unleaded regular gasoline is $2.28, which means that prices around my area are just a little lower than the average at $2.23 a gallon. This is up 6.3 cents over last week and almost 50 cents from a year ago. Even more interesting, wholesale prices for gasoline fell 11% last week, but the retail price just kept going up. Does this look like gas stations taking advantage of us or what? It isn't like there is a shortage of gas or anything; refineries output an additional 424,000 barrels per day last week. In economic terms, gasoline is relatively inelastic. This means that even though the price changes, the quantity demanded (the amount to fill up your tank every week) stays roughly the same. This is great for gas stations because they can charge whatever they want (to a reasonable amount) and still sell their gas (boy aren't we a bunch of idiots). Typically you can add 65 cents to the wholesale price of gas and get the retail price. 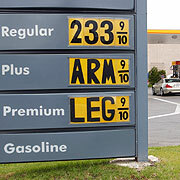 Hopefully the wholesale price will keep coming down, and the gas stations will finally lower their prices. Until then, I will keep my foot in my mouth and not suggest to anyone (even my wife) that prices will be falling in the near future.